Why don’t you join Deep Space for their 1st event in 2012? Percussion Lab Radio will be on the mixing board all night. Before 11pm with a printed Efler for this event you will get FREE admission & complimentary cocktails. Percussion Lab is a collective of like-minded artists, DJs, record labels & selectors. Since 2002. Percussion Lab has been curating an exclusive collection of live & DJ sets from our favorite artists, DJs & record labels. They began in the summer of 2002 as a radio show on the independent upstate New York radio station, WVKR. Hosted by Praveen (Braille / Sepalcure) & featuring the talents of turntablists Killa K & Lord L, the show consisted of the best Electronic & Underground Hip Hop music for a new kind of beat generation. A few years later, Percussion Lab relocated to New York City to throw a thriving series of events featuring artists like SBTRKT, Scuba, Flying Lotus, Jimmy Edgar, Machinedrum, Khonnor & more. In just two years, NYC's TURRBOTAX® parties have quickly become internationally known as THE place to hear cutting-edge music in America. Their reputation for being ambitious & having creative lineups have made them a name to watch in NYC nightlife. Drew Cyrus Lustman is a musician in love with complexity & beautiful simplicity alike. His own unique take on the intersection between house, hip hop, funk & UK garage is one of the best musical projects to come out of NYC in years. Dave Q founded the seminal New York club night Dub War in 2005 also runs the record label The Index with New York electronic/dub composer Raz Mesinai. His DJ sets are forward-thinking explorations of new forms of bass music which manage to be both experimental & dance floor friendly. Praveen Sharma is the founder of Percussion Lab &one half of bass music duo Sepalcure. Praveen’s love for house music resulted in four bubbling, soulful house tracks infused with unique style adorned with tasteful sample manipulations & a warm, emotive foundation. 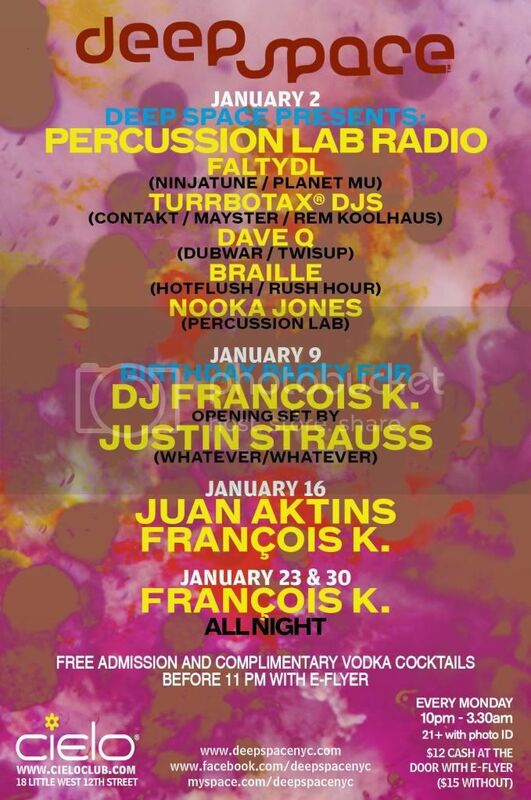 Percussion Lab resident Nooka Jones has quickly become one of NY's new guard of DJs. He has an open mine & an extensive knowledge of dance music history & skills. Each of his genre spanning sets he throws down is always a lesson in soulful, body moving electronic beats defined by seamless mixes.